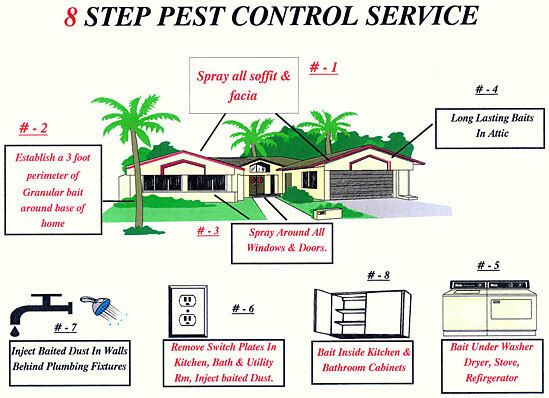 Call for our customer friendly pest control service at (813) 685-8444, or if you are on your phone, just click the above button! Most Residential Homes and Commercial Buildings Controls: Roaches, Ants, Silverfish, Spiders, Crickets, Earwigs, Centipedes, Pantry Pests and more! Call for our Animal Trapping Agreement. One of America's Most Popular Pest Control Products. Tim-bor Wins the Fight Against Drywood Termites, Decay Fungi, Carpenter Ants, and Wood Boring Beetles. Highly Effective Water Soluble Economical and Odorless. Can be used in conjunction with Fumigation for Residual Protection. Formulated with a concern for the environment. Termidor© termite insecticide is the most effective of a group of newer liquid treatments. Termidor allows termites to forage in a treated area, then unknowingly pass the insecticide on to other termites during normal activity. This ensures that even termites that don't directly come into contact with a treated area will still be wiped out. Click Here for more information.